Charcoal Making Anecdotes - Charcoal Gasification - Drive On Wood! I thought about you today when I saw a landscape company use a plug aerator. One of those wheels with the proper rotating tray and a hand crank would make those pellets faster than you could use them. Thanks guys for the input. Things did not go as expected today. the new briquette maker fell together nicely, but the one-two three fantasy was a pipe dream . I needed to hammer several times to get a tight briquette. So much for 1000 briquettes per hour. More like a hundred or so per hour. I did several samples to compare density based on number of hits. Also, this batch was also done with more coarsely screened charcoal. It is supposed to be sunny for a couple of days so i should get some results soon. Yes, we are blessed to have Francois sharing his expertise with us. Good thinking about using lighter pipe! I can hardly wait to build it. 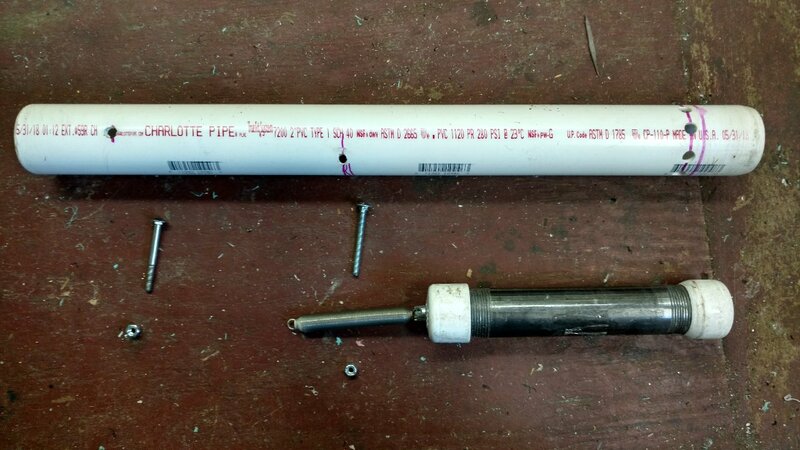 I’m thinking maybe EMT pipe with an internally weighted PVC piston? Lighter pipe is good for the arms. Small warning though, in my experience with such devices, you need to protect the contact surface more than you think. We tried lighter stuff cutting plugs and a couple other similar applications. Found out that you will inevitably hit off-level and bend the edge, or hit a rock or something, and the end of the pipe will not long be round. PVC might be better than metal for that. Also, after not-so-long-use metal pipe will begin to mushroom unless the contact point is pretty heavy. koen, why not befriend you, I have my pass port, and quickly I can visit you. I have a professional trip atipique, which for me at first did not make sense, but now that I know the military history of my grandfather, everything became clear, I started carpenter, then at 28 years I I became a public works land surveyor, then a public works contractor, I created a public works company in tarring. 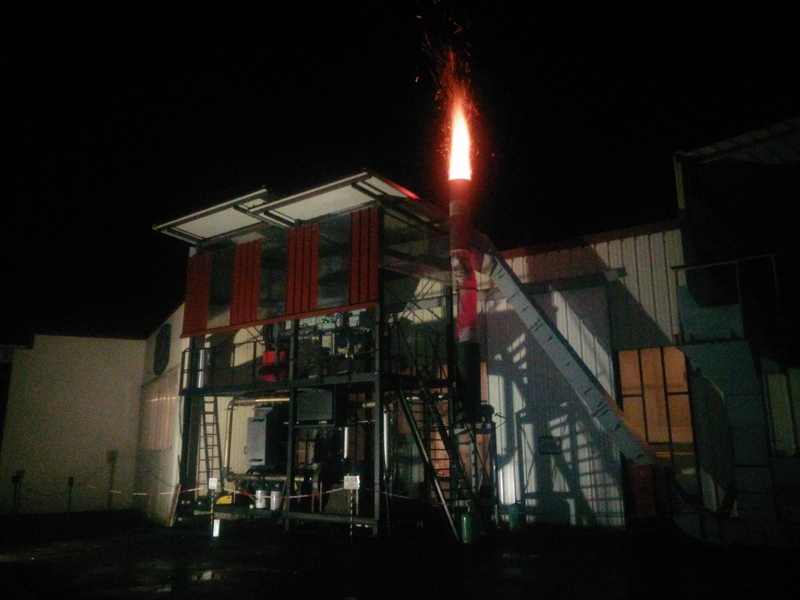 I built a turret machine on a forklift (https://youtu.be/NXGeXZMV50w) to make small areas, then I had health problems and I had to sell my business, so after my recovery, I looked at energy, and understood that for the planet, the wood gasifier was a solution for have renewable energy. this is since 2011 that I build gasogens. so I come back to my grandfather, he made a military campaign in Cilicia in turkey from 1919 to 1921. in his journey, he was rescued by African gunner several times, he had nine children so my father the elder of his children. and if that day of May 28, 1920, had he been killed, my whole family would not be born. his story on the website eliecilicie.net, when you came across louis p, it’s my grandfather. which explains my professional career, carpenter for gasifier formwork, geometer for drawing and presicion, entrepreneur for the management, now everything has a meaning to my life, I managed to convince my company where I realize prototypes to build container gasifiers for africa are equipping the villages, so the unqualified little hands are looking for dead wood in the forest, giving them a small income and in the evening the group gives electricity to the little schoolboy to do their duty. koen, I am not a scientist, but a passionate, and to the extent of my skills, I am willing to meet you in your country, we always learn from others. 600KW / h thermie, it will be good for your drying device in your factory, a very great regularity in volume and quality of syngas. My co-worker has a side business as a barbeque chef. He is real particular about controlling flavor with his marinades and sauces. So instead of using tarry commercial wood charcoal , he prefers my high temp retort charcoal. You gotta respect these folks and their ingenuity! I love the “hand” air pumps. How about something like the below video? Replace the wedge with a tube. Limit the travel. Pellets exit the top of the tube. Movable charcoal troth below tube. Thanks, Jeff. I am still looking for the best way to make engine fuel from crop waste. Currently it is a toss-up between making mini-briquettes and pyrolyzing cassava stems. I’ll give this spring balanced hammer method some thought. If I follow your thinking, I could also just keep hammering my tiny briquette tube by hand until the charcoal comes out the top then knock off pieces as they come out the top. BTW, I built one of those log splitters. They work, but much I prefer a splitting axe. I could also just keep hammering my tiny briquette tube by hand until the charcoal comes out the top then knock off pieces as they come out the top. Maybe cone shape or a choke might help compress or just longer. Should break off by it’s self. Nice project, wish I could be there to help ! ! ! 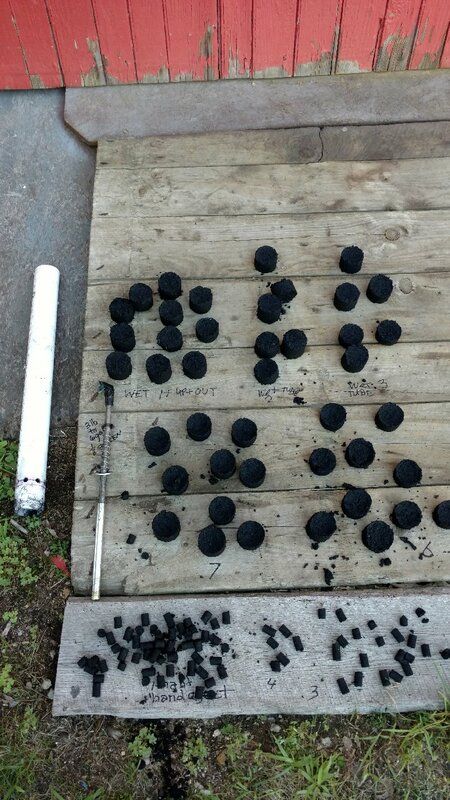 I carbonized switch grass and rolled the dust into fireballs inside a cement mixer with the stirrers removes. Your way is easier. Thanks for posting, put a smile on my face and hart! For more info on Kristijan’s kiln see “New Charcoal Kiln…” under General Discussion topics.